Beverly Haffer and Fran Browe work on our next raffle quilt. New member Jodie Spiller works on binding a charity quilt. 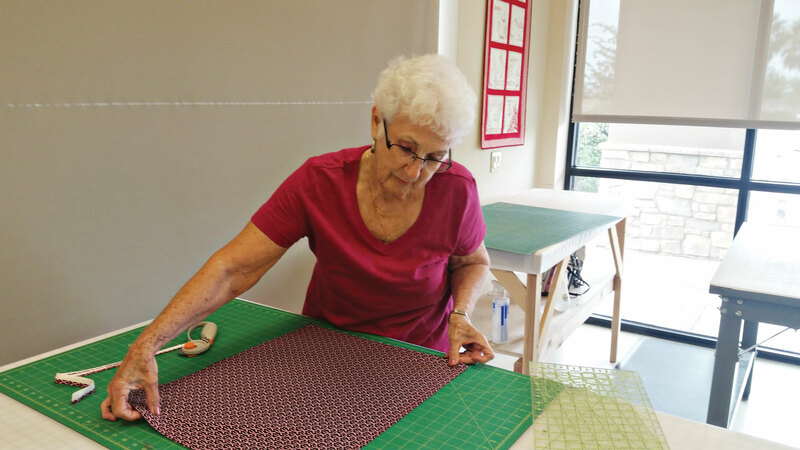 Dottie Welsh works on her next quilt. Summer has come; the snowbirds have gone to their winter homes. 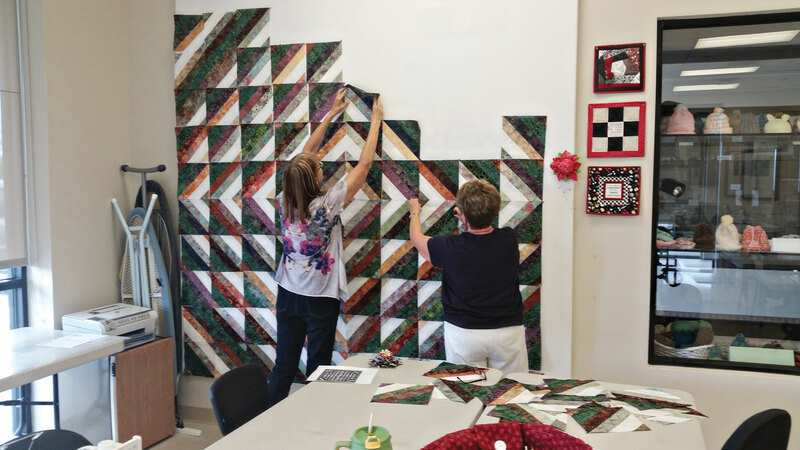 Some are spending time traveling around the U.S. visiting family and friends, while those who are still in Arizona have either retreated into their homes, headed north to the mountains or are busy at the CAC quilting, sewing and giggling. In March the Material Girls had one of our “quilt ‘til you wilt” events. We start at 4:00 p.m. and sew until we wilt and/or cannot sew or see any longer. As usual our emphasis was on our charity quilts, and we all made one block for a charity/comfort quilt. Never forgetting our need for sustenance, we all brought an ingredient to add to a chicken Caesar salad that we shared. In addition there was no shortage of yummy desserts. We all accomplished work on our own projects, a charity quilt top and had lots of fun and laughter. The Robson Ranch Material Girls (and Guys) welcome all quilters and seamstresses, male or female, to join. Our dues are $20 per year, and you may visit two times before we ask you to pay your dues. All money collected from dues, profits from the sale of quilt raffle tickets, as well as any money earned from other fundraising activities, support the purchase of fabrics and supplies to make comfort quilts for our own residents who have a serious illness or have lost a spouse and member-made quilts donated to various local charities. 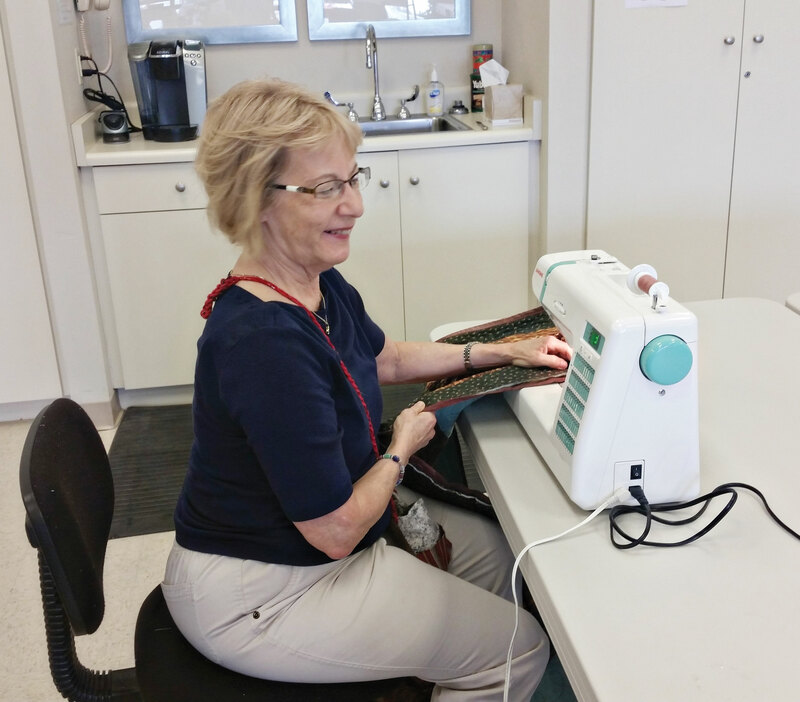 Bea Pressler, our charity/comfort quilt chair, has challenged all members to make a quilt top, quilt or sandwich a top together and make an item or items for the Arts & Craft Show in November. Come to our first meeting of the new season; we should have an abundance of charity/comfort quilts and special items to sell at the Robson Ranch Arizona craft show. We are all very excited about our choice of charity for next year. We will be making children’s quilts once again. Recipients will be the Eloy Police Force and the Family Advocacy Center for Children. The Eloy police are being given 12 quilts to keep in their cars in the event they have picked up a child from an accident scene or anywhere else. The Family Advocacy Center for Children will be given kids’ quilts in various sizes from infant to teen. It was opened in April of 2005 and is dedicated to reducing the stress children experience as victims of crimes. Children are taken there for a variety of reasons, from a domestic situation to a fire. They are never kept at the Center but are moved to a foster home or returned to their own home. We will also continue to support new residents of the Senior Apartments in Eloy by giving each new resident a quilt. New classes and events are planned for the fall. Stay tuned for more happenings. For more information call Sue Price at 520-836-5286. Come join us for sewing fun and fellowship.